Nothing heals quite like the love of an animal. 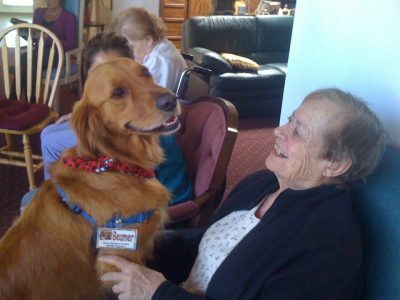 Our Animal-Assisted Programs bring pets and their guardians to visit people throughout Marin including convalescent and acute care hospitals, senior communities, schools, libraries, homes, and at community events. Animal-ambassador teams (volunteers and their pets) bring joy and companionship to many. The majority of our programs are animal-assisted therapy, but our trained volunteers also bring animal-assisted education to schools and our campus and host information booths at community events. We’ve proudly partnered with Marin General Hospital for over 30 years, bringing dogs to visit patients in cardiac and intensive care, the mental crisis unit, and the senior-day program. Our animal-ambassador teams also visit the waiting room at Marin General’s radiation and infusion centers. We visit Kaiser Hospital, Hospice by the Bay referrals, day programs, and wellness centers, and provide one-on-one visits to people in their homes. Our volunteer teams work closely with teachers to help children with disabilities focus on their lessons and improve their academics. We also bring special lessons to the Irene Hunt School, teach a unique canine agility program, Jumping for Joy, for students on the autism spectrum, and offer a reading program, Share a Book, in schools and libraries. Our teams provide a variety of lessons, from dog bite prevention o student advocacy (in both public and private schools), and work closely with teachers to complement their curriculum goals. Contact the Community Engagement department for more information about our Animal-Assisted Programs. I am interested in volunteering with my dog in your Animal-Assisted Programs. How do I get started? To get started, we invite you to attend one of our volunteer orientations (take a peek at upcoming dates). After you and your dog have been pre-screened, you can then register for the next available “Your Dog to Share” class through our Behavior & Training Department. All dogs in this program must be spayed or neutered. The Your Dog to Share class will teach you safety skills and how to read your dog’s body language. You’ll experience mock visits, get an introduction to medical equipment that may be in use, hear from guest speakers, and shadow visits from active, experienced volunteers. The class culminates in an off-site graduation at a senior community. All dogs are required to have a solid foundation of skills and the desire to engage with people. Marin Humane’s Good Citizen Test for Dogs is part of the class, and your do must be able to pass this screening. All potential volunteer teams must be pre-screened before being accepted into the class. If you’d like to receive a list of necessary skills and an outline of the class, please email Community Engagement. Our classes do not “certify” your animal to visit anywhere at anytime. All our animal-ambassador teams are assigned by the program coordinator to visit various venues. You are a volunteer for Marin Humane when assigned. Therapy animals are not legally defined by federal law, but some states have laws defining therapy animals. They provide people with contact to animals but are not limited to working with people who have disabilities. They are usually the personal pets of their handlers and work with their handlers to provide services to others. There are no provisions in federal law that allow therapy animals to frequent places of public accommodation that have “no pets” policies. Therapy animals are not usually service animals. Marin Humane does not train service dogs to be volunteers in our program. I want to prepare my puppy to be a part of your program. What should I do? The best way to prepare a puppy for visiting is to socialize, socialize, and socialize! Expose your puppy to a variety of people and situations in a positive and gentle way (be sure your puppy has had their required series of vaccinations). Introduce the puppy to wheelchairs, canes, and carts of any kind and, if possible, visit a senior community (with permission from the facility and a completed rabies vaccination certificate). Handle your puppy all the time all over his/her body and get them used to being handled by other people besides you. Be sure to teach your puppy the polite way to greet people and start taking classes as soon as they are old enough. Classes will not only teach your puppy the basics, it’s one of the best ways to bond with your canine companion. It’s important your puppy has their “puppyhood” behind them before they volunteer. Depending on the individual dog, most are not ready for the Your Dog to Share classes until they are at least 18 months old. You may do all these things when your dog is a puppy but your companion still might not be a good fit for the work. A dog’s temperament is related to who they are as individuals, their genetics, and their breed or mix of breeds. Some dogs are more interested in socializing with people than other dogs. But some are not. Hopefully, your puppy will be as interested in becoming part of an Animal-Assisted Programs as you are!